The Birman Legend is a remarkable story but explains little of the true origins of this beautiful breed. 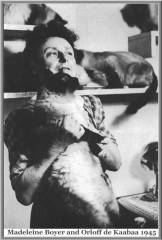 One story claims a pair of Birmans was given as a gift to an Englishman named Major Gordon Russell and his friend August Pavie by the priests of the Khmer people; another that the cats were acquired by an American named Vanderbilt from a servant who had once been at the temple of Lao-Tsun where the cats were kept as sacred animals. 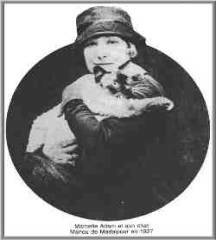 Most historians agree that the original two cats were shipped to France and that the male died on the way. 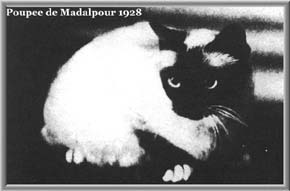 The female, named Sita, is said to have been in kitten and to have produced a kitten named Poupee de Madalpour (a picture on this page) which was owned by Ms Leotardi in France and exhibited in 1926. 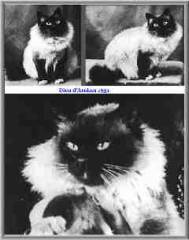 So, we know it was in existence in France in the 1920's, but unfortunately the records of the Birman and their breeding history perished in World War II. We know that only two Birmans survived the war in France. “Orloff and Xenia de KaaBaa”. A program survived the war in Germany with von Frohnau and von Irak catteries. For the breed to continue after such a setback shows the dedication of the Birman fanciers at the time. 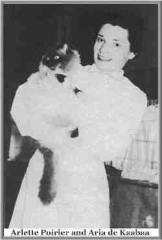 It was not until 1955 that the breed was recognised again on full registration. Birmans were imported into America for the first time in 1956, followed by England in 1964 to the now famous Paranjoti cattery. It was not until 1967 that the first Birman set paws in Australia. “Grand Champion Stacpoly Kharma” and “Praha Shigatse” were imported by Mrs Judith Starky of Sydney, beginning the Birman love affair. Since then the breed has developed a devoted following of dedicated breeders who have come under the spell of this most beautiful feline.